Spatial Insights “Map-O-Matic” is a MapBasic application that enables batch processing and production of maps within MapInfo Professional. · Batch maps can be produced for any/all individual objects in a MapInfo table or by grouping different objects using a field value. · Map titles can be generated from a column in the table Scale bars and north arrows are also available for each map. · The maps can be printed or saved as WMF, BMP, JPG or PDF files. · Separate MapInfo workspaces can also be saved for each map. 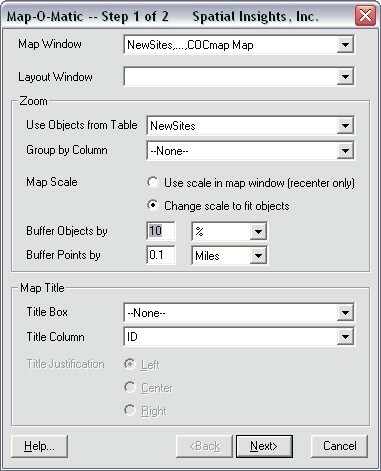 · Use a fixed scale for each map, or let Map-O-Matic determine the scale and map extents based on a buffer or radius around specified objects. If you are using MapInfo Professional and have numerous maps of the same theme to produce (i.e. customer distribution by state for all states), Map-O-Matic is guaranteed to save you time and produce consistent output based on your specifications.